4.5 oz. 100% polyester moisture management jersey is soft spun to feel like cotton. Ribbed V-neck collar. Shoulder-to-shoulder taping supports the fabric from overstretching and provides long lasting quality. Double-needle hem sleeves and bottom EasyTear™ labels for additional comfort and ability to brand as your own. Machine washable/ tumble dry low. 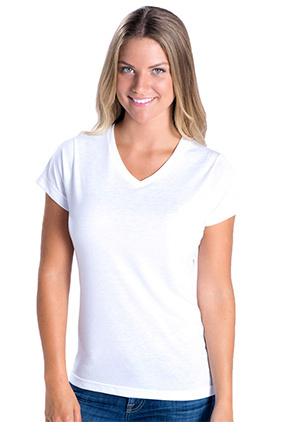 Fit: Ladies Modern - Semi-fitted.